In 1980 South Africa competed for the first time in an international competition. A team of five, comprising four chefs and a manager with “salt in their back pockets” and a lot of enthusiasm. They represented South Africa at the Culinary Olympics; bringing home five individual gold medals and winning fourth place overall in the hot kitchen competition. SA National Culinary Team 1980. 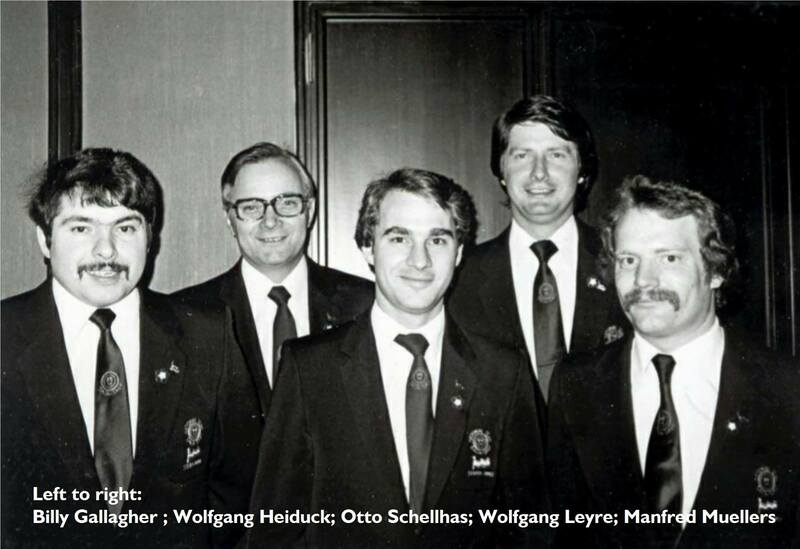 Left to right: Billy Gallagher ; Wolfgang Heiduck; Otto Schellhas; Wolfgang Leyre; Manfred Muellers. In 1988 three South African teams competed in the Olympics. The National Team, a City Team and a Junior Team. The teams returned with gold medals but still no place in the top three. But at the fourth attempt, the South African team was crowned World Champion in the Restaurant of Nations, the most prestigious category other than the overall winner. It also came third in the Restaurant Dishes category. Twelve years of hard work and dedication had paid off. For the first time ever in the year 2000, the South African National Culinary Team was a wholly South African born and trained team. It seemed that the years following also brought many victories for the South African Team; in 2008, Culinary Team SA brought back a gold medal in the Hot Kitchen section – the first gold to be won by South Africa in 16 years. The South African Culinary Team officially received South African Team status by the Department of Arts and Culture’s Bureau of Heraldry; the recognition reflected the enormous achievements of the South African Chefs Association and growth of the South African National Culinary Team. The Internationale Kochkunst Ausstellung (IKA) began in Frankfurt, Germany, in 1900 when a group of visionary chefs decided that a culinary competition was the best possible forum for sharing information on food and techniques with their neighbouring countries in Europe. The history of the IKA – better known as the Culinary Olympics – is dominated by the energetic and inspirational figure of Matthians Carl Banzer, founder of the IKA. Banzer developed the IKA into the biggest and most prestigious food exhibition in the world. It is he we have to thank for the IKA’s existence – his hard work, perseverance and dedication. From the year 1900 until the sixth cooking exhibition, in 1934, Banzer personally undertook the organisation of the show and laboured to ensure its success. The world’s first cooking exhibition took place in 1894, against the backdrop of the turbulent history being made by the then Prime Minister of Prussia, Otto von Bismarck. In this war-dominated environment, the first cooking exhibition focused on areas like mass feeding and army catering – in keeping with the economic climate of that time. Bakers and pastry chefs, in particular, came into their own. Banzer became a member of the Frankfurt Chefs’ Association one year later, in 1895. By 1900 he had become the force driving behind the IKA and created that heady sense of euphoria that dominates the Culinary Olympics to this day. In those early days, the competition did not take place every four years as it does today. The second IKA was held in 1905 and the third in 1911. World War 1 became a trying time for the IKA, for nearly 14 years there was no exhibition, and the fourth IKA was only held in 1924. Since then the staging of the cooking exhibition has been interrupted only once, by World War 2. 1956 saw the inception of the World Culinary Olympics as we know them today – a forum for chefs from all over the world to come together in friendly and stimulating competition, and to share information and ideas. Chefs from 11 countries competed in categories similar to the current categories. Since that year the Culinary Olympics have been held every four years, just as the sports Olympics are, and the IKA has grown into the most important event on a chef’s competition calendar. Today, there are over 54 countries competing for the title of Olympic Champion in Cooking. And it is at these Olympics that new trends are set. Nouvelle cuisine first saw the light of the day here, as did the 1960 gold medal-winning dish of prime rib beef and a baked potato – a dish which is as common as bacon and eggs today. It is every chef’s dream to represent his or her country at the IKA Culinary Olympics. Now, as it was when Banzer staged the first IKA, the Olympics’ primary objective is to unite the world through cooking. It is a forum where masters and apprentice teams meet to exchange ideas and learn from each other. We salute the South African Champion Team and Mr Matthias Banzer. After all, without the creator of IKA the Olympics in Cookery would not exist.